​Congratulations! You are planning your wedding ceremony. What would you like it to be like? So many couples assume the ceremony "is what it is", but that is where you have more to learn. Choosing the right officiant can change your whole experience. I recommend finding an officiant who is your desired personality, but also engaging and interactive  - that will take your ceremony to the next level. 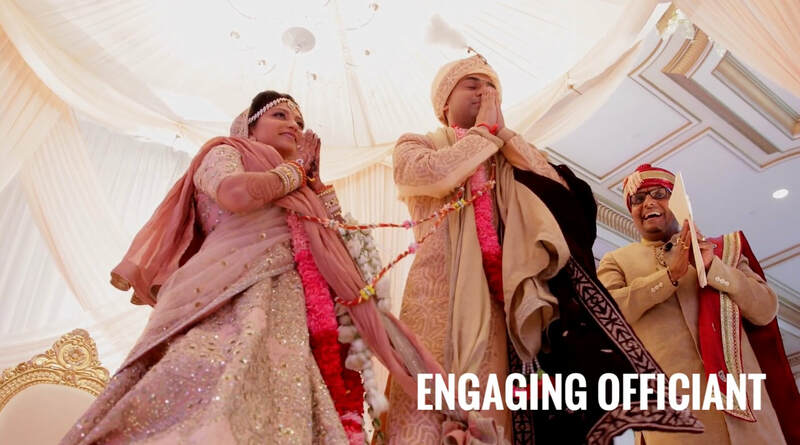 Hindu weddings are often long, and humans do not have a long attention span. If you would like for your guests to attend the ceremony, sit through the ceremony, and (dare we dream) enjoy the ceremony, then choose an officiant who maintains the focus of your guests. Here are a few examples of interactive experiences... Guests can rise when the bride enters, raise a hand to bless the couple, repeat after the officiant, applaud an important moment, married couples can stand in support, and there are more. Keeping guests active and attentive means that they will be truly present and all of you will enjoy the ceremony that much more. Afterall, the ceremony involves the couple, families, officiant, God (for those who believe), and guests!